With three out of the last four weekends at the box office dominated by a singular, all-hype-swallowing film, we're back to having a grab bag of movies that try to each grab a different demographic. Leading the way is a family/kiddie effort, G-Force. 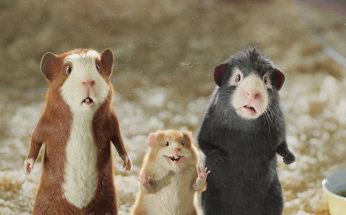 A live-action/animation mix with 3-D thrown in, it centers on a group of guinea pigs chosen to head up an elite government task force, aimed at stopping an evil billionaire from taking over the world with household appliances. It's good to see that Hollywood is back to greenlighting films while high. With the voices of Sam Rockwell, Tracy Morgan, Jon Favreau, Penelope Cruz, Steve Buscemi and Nic Cage as the guinea pigs and human acting from Zach Galifianakis, Will Arnett and Bill Nighy, it's got that mix of celebrity cast and adolescent action that generally means ridiculous box office. While poop jokes are no one's idea of high-class humour, the kiddie set unquestionably finds them hysterical. Hey, adults have made Dane Cook a star. Who are we to judge? And with enough winks and nods to traditional action movies, adults probably won't be dreading sitting along with their kids. I see this playing something like a combination of Bolt and Alvin and the Chipmunks (which, you might remember, had a rather disgusting poop joke right in its trailer). With 3-D starting to reach a critical mass as an attraction for moviegoers, G-Force might well be ideally positioned at this point in the summer to be a breakout hit. It'll still have the second week of Potter to deal with, but much of the mania will have subsided for it, letting this be the fresh new product for family viewing. Opening on over 3,600 screens, I'm sensing a high "want to see" among the 12 and under set, and this should see an opening weekend of about $33 million.